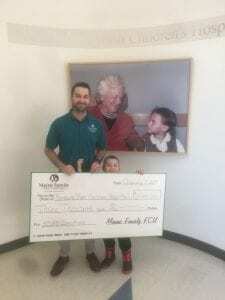 Maine Family Federal Credit Union Does it Again! 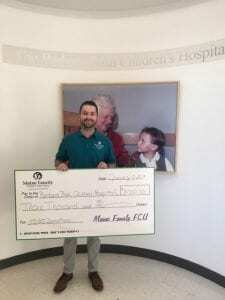 As one of our valued Children’s Miracle Network Hospitals partners, Maine Family Federal Credit Union held a 50/50 raffle during the holidays to benefit The Barbara Bush Children’s Hospital. This was their third year holding the fundraiser, and they had a record-breaking year! Maine Family FCU raised $3,000 through the raffle! James and Alex (5, his wonderful son) of Lewiston made the trip to Portland last week to drop off the check at The Barbara Bush Children’s Hospital. Thank you so much to Maine Family Federal Credit Union and their members for making this amazing donation possible! Next post: Westbrook DQ Continues Reign as “Most Miracle Treat Day Spirit” Champs!